Clan Turnbull is a Scottish clan. A legendary account of the Turnbull name was told by Hector Boece, in his History of Scotland. Boece tells the legend that during the Wars of Scottish Independence William of Rule saved King Robert Bruce by wrestling to the ground a bull that had charged at the King. For this feat, the King rewarded William with the lands of Philiphaugh, now part of Selkirk, and dubbed Rule "Turnebull" (the "e" was later dropped from the name). It seems more probable, however, that Turnbull is derived from the Old English Trumbald or French Tumbald (meaning "strong and bold"), or that Robertus de Turnbulyes, who swore fealty to King Edward I of England in 1296, could be the family father. Robert the Bruce awarded lands in Philiphaugh to William Turnebull. 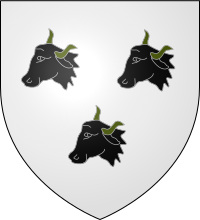 William Turnebull assumed a bull's head as his heraldic symbol with the motto, "I Saved The King" — both of which have been incorporated into the Turnbull clan crest. The name Turnebull was not recorded before 1315, when William was awarded the lands in Philiphaugh — and following this time, use of the Rule surname dwindled while use of the Turnebull surname increased. The Turnbulls were to become one of the most turbulent of the Borders families. A Scottish nobleman, sent to see if the Turnbulls would back their claim to the throne, reported back that they had no care at all for politicians but always yearned for a fight. Before the Battle of Halidon Hill in 1333, a champion on the Scottish side, a huge man named Turnbull, accompanied by a huge black mastiff, approached the English host and challenged anyone to single combat. Sir Robert Benhale, a Norfolk knight, answered the challenge and killed both Turnbull and his dog. Benhale returned to the English host, bearing Turnbull's head as a trophy. Major Gordon Turnbull led the vicious counterattack on the French Cavalry by the 2nd Scots Greys at Waterloo. Though outnumbered some 2-1, the Scots broke Napoleon's famed cavalry, and the Greys destroyed most of Napoleon's legendary Nogue's brigade, resulting in the capture of the eagle of the 45th Ligne. According to Wellington, they "had little tactical ability or nous"[common sense], "but fought like raging bulls". This was taken as a compliment by their Turnbull leader, whose son, brother and three cousins rode into battle: five were wounded and one died. James Hamilton, overall commander of the Greys and the other Scottish cavalry regiment (who were supposed to form a reserve), ordered a continuation of the charge to the French Grande Batterie. Though the Greys had neither the time nor means to disable the cannon or carry them off, they put many out of action as the gun crews fled the battlefield. Some historians note that this action had a very direct outcome on the battle itself. Two Turnbulls were Scottish recipients of the Victoria Cross, the highest and most prestigious award for gallantry in the face of the enemy that can be awarded to British and Commonwealth forces. The most famous being James Youll Turnbull, who single-handedly held a position for 24 hours, against almost a full regiment of Germans, with a machine gun in World War I. Each time the British tried to send reinforcements, they were wiped out due to the open ground exposing them to deadly crossfire. The ground was held by Turnbull singlehandedly, and this story became renowned for the British people in the dark days of the war. He died the next day while leading a Brigade of Highlanders on a grenade attack, which eventually turned the tide of the deadly stalemate where some 50,000 soldiers on both sides became casualties. Winston Churchill himself wrote on this defense in his book stating: On 1 July 1916 at Leipzig Salient, Authuille, France, Sergeant Turnbull's party captured a post of apparent importance to the enemy who immediately began heavy counter-attacks, which were continued throughout the day. Although his party was wiped out and replaced several times, Sergeant Turnbull never wavered in his determination to hold the post, the loss of which would have been very serious. Almost single-handed he maintained his position, displaying the highest degree of valour and skill in the performance of his duty. Later in the day he was killed while engaged in a bombing counter-attack. The Germans were said, after seeing the body of Turnbull in his uniform kilt, to call him and all Scots "The Devils in Dress" and "Ladies from Hell!" The Turnbulls held land throughout the Borders. They were the only clan to have a bounty placed on them by the King. William Turnbull received a charter from Robert the Bruce in 1315 to land near Philiphaugh, and John Turnbull received the lands of Hundleshope from King David II of Scotland. John Turnbull, nicknamed "Outwith sword", for his fierce temper, is listed as a Scots prisoner of war in England around 1400. William Turnbull held a papal appointment in 1433 and this same name appears as one of the canons of Glasgow Cathedral in 1452. Stephen Tournebulle represented Scottish interests at the University of Orleans at the beginning of the sixteenth century. William Turnbull, Bishop of Glasgow, procured from the Pope a charter to establish a university in Glasgow in 1450. The Bishop's vision was realised when the University of Glasgow was founded in 1451. Many Turnbull families moved into the Cheviot Hills and into the northern lands of Northumberland depending on the politics of the day and the King of the day. Those who became "English" also changed from their Presbyterian roots to being Church of England. For example, John Turnbull was born at Roddam in 1789 in the Anglican Parish of Ilderton, but was baptised in the nearby Presbyterian Church at Branton. There were many small Presbyterian Churches dotted around Northumberland as several Scottish families crossed the border to live. He, along with others, eventually attended Anglican churches. John Turnbull's latter children were baptised in Anglican churches. This John Turnbull went on to being the Land Agent for the Earl of Liverpool in the little Shropshire settlement of Pitchford from the 1820s to the 1850s. Famed Confederate General Samuel McGowan (general)'s mother was a Turnbull. He commanded a brigade in A.P. Hill's famous "Light Division" and was wounded several times. Ezra Warner's book, Generals in Gray claims that "McGowan's career and reputation were not excelled by any other brigade commander in the Army of Northern Virginia." His first cousin was Major Thomas Turnbull who was in charge of the battery that held its ground in the legendary Pickett's Charge. Thomas stayed loyal to the Union and was forever outcast from the rest of the family as 17 Turnbulls served for the Confederacy. Thomas survived the war and later was discharged from the army for being too favorable to the Southern whites during Reconstruction by the Radical Republicans under his chief and mentor Hancock who also was dismissed as the head of Reconstruction in Texas. He reportedly killed one cousin during Pickett's charge, making the Turnbull family the only one to have kin on both sides during the crucial battle, and actually faced off with one's regiment killing the other. John B. Gordon's maternal grandmother was a Turnbull according to his book Reminiscences of the Civil War. He was first cousin to another General Sam McGowen In it he tells how his ancient Scottish warrior traits and instincts helped him become the leader of Robert E. Lee's Army of Northern Virginia. Though he had no formal military education, he was to become the South's most daring of Generals rising from a Private to Lt.General. He has the remarkable achievement of never losing a battle or an attack that he led himself. He later became the Hero of Georgia and the most beloved man in the South after the Civil War. Robert E. Lee stated to many that General Gordon's courage was of the highest order and that with his quick, keen, shrewd intelligence made him the most brilliant and successful soldier in 1865. His first cousins the Turnbull family were the last of the "First Family" during the Siege of Petersburg, and was the residence of Robert E. Lee for the last 13 weeks of the war. For their loyalty during the tough times Lee's family bible was given to Mrs. Turnbull who had three sons, one killed and two wounded in Lee's army of Northern Virginia. 17 Turnbulls fought for the Confederacy during the Civil War with 5 dying in combat (two of which in Picket's charge where family lore claims it was a Turnbull who jumped over the wall first, Jacob Turnbull 1st Sergeant for the 2nd Va was reported to be the highest ranking NCO to lead Regiment over the wall after all officers were either killed or wounded), 7 dying of disease and 5 others being wounded in combat. Lee's Family bible was returned by Scott V. Turnbull to R.E. Lee's son at Lee's funeral in 1870 per the Richmond Papers. William Turnbull, a noted nineteenth-century American ornithologist, was born in Midlothian in 1820. Herbert Turnbull, who died in 1961, was a distinguished mathematician responsible for major contributions to the study of algebra. Stephen Turnbull is an author who writes about medieval Japan and its people. He has had great success from his books selling over 6 million. Douglas Myers-Turnbull is a scientist at the University of California, San Francisco working on zebrafish models for neuroactive drug discovery. Bill Turnbull, (journalist), born in Surrey, England, currently works for a radio station, Classic FM. George Turnbull, born near Perth in Scotland, was dubbed "The first railway engineer of India", having been the Chief Engineer building some 500 miles of the first railway in the 1850s from Calcutta towards Delhi.